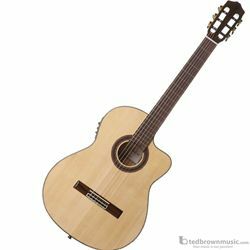 The GK Studio, a Gipsy Kings signature model, is slightly deeper than the 55FCE yet thinner than a standard Spanish guitar. It is an extremely comfortable guitar for any player. The tone is bright and snappy, the action is low across the fretboard, and the neck is slightly narrowed. A Fishman Presys Blend with 4 Band EQ and digital tuner pickup system gives the GK Studio a clear and natural tone when amplified. Comes with a Cordoba deluxe gig bag. Click here to download the Fishman Presys User Manual.